There are heated arguments at Hero HQ about Wes Anderson’s best + worst movies, most of the Heroes get stuck on The Royal Tennebaums for lazy Sundays but we have friends that truly love The Life Aquatic. Lets just not talk about Darjeeling Limited unless you just messing to mess. But back to The Life Aquatic, not totally committed, still we loved its spirit and of course we love the idea of Team Zissou Shoes! 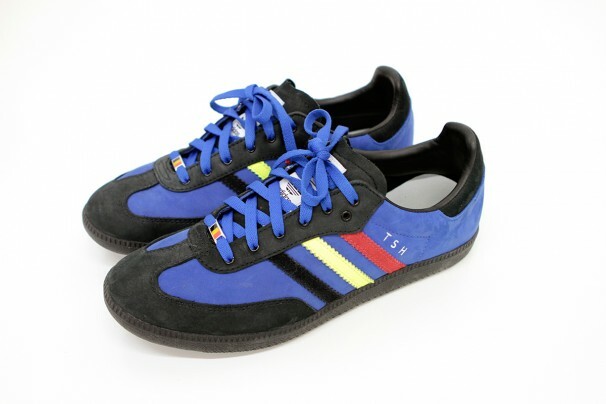 So we visited the custom adidas site and built us some custom TENSPEED HERO Belgium Team Kicks. TSH Luke has been wearing them for a week and they are starting to get scuffs and scratches. Yeah, maybe not as extreme an emotion as scratching your brand new Pegoretti but you can imagine how he feels. All of this club building has us uttering new mission statements as we type and prepare stories for next week. Number One Goal is to sell enough socks and t-shirts to have the Tenspeed Hero crew show up in Belgian Kicks to our studio in March so we can watch the Belgian Classics in Style. Club building is all about special rules, nods, winks, rituals and of course cool sneakers. If you are so inspired??? Build your own and send the Heroes pictures please! Tags: Gem Atkinson, Heroes, shoes.